【UNESCO Intangible Cultural Heritage】Gion Matsuri is an annual festival of the Yasaka Shrine located in Higashiyama of Kyoto, and is one of the three biggest festivals of Japan. When July comes, it is the most vibrant and festive month for Kyoto. The month-long celebrations with its over 1,100 year-long history makes the festival a rare occurrence even for world standards, attracting hundreds of thousands of visitors from all across the country and abroad. The highlight of the festival is the "Yamaboko (sometimes pronounced Yamahoko) Junko". 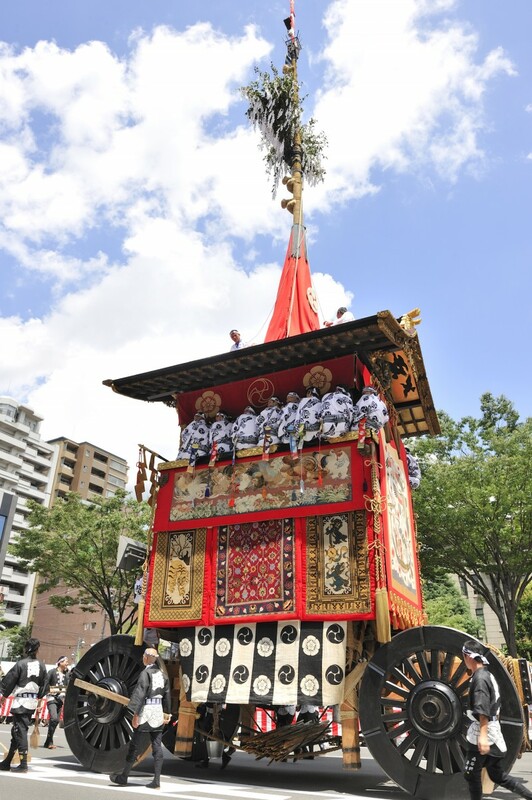 From 2014, the festival format has returned to its original form for the first time in half a century, with the total of 33 Yamahoko floats separated into parading during Sakimatsuri (July 17th) and Atomatsuri (July 24th). The floats known as Yamaboko reach up to 12 tons in weight, and are pulled on wooden wheels with the chanting musicians aboard. The sight of them covered with few-hundred year-old treasures gathered from all over the world, is no short from a moving museum. 29 out of the 33 remaining floats are designated as the nation's Important Tangible Folk Cultural Property, and the Yamaboko events of Gion Festival are recognized as a UNESCO cultural heritage. 1. Enjoy the Gion night festival during the "Yoiyama"! Yoiyama is the pre-party of the Yamaboko parade, held from the 14th through 16th (Sakimatsuri Yoiyama) and from the 18th through 21st (Atomatsuri Yoiyama). At the floats' standby positions ("Kaisho"), the paper lanterns are lit-up at night amplifying the festive atmosphere as the Gion-bayashi chanting begins. Ornaments used for the Yamaboko are on display at some of the Kaisho, and is recommended for those who want to take a closer look at the floats. 2. "Konchiki-chin"—the festive chants ring out in the big streets! The parade of the Yamaboko floats highlight the festival. It originated as a ceremonial act to calm the bad omen that brought plagues. As the festival became larger, each district began competing each other with their unique floats, giving birth to the beautiful and elaborate Yamaboko's. It is an impressive sight to see and hear them pass, with the sounds of its wooden frame creaking as the musicians aboard sing and chant the Gion-bayashi. You cannot miss the climactic "Tsuji-mawashi", when the Yamaboko are spun 90°at intersections! For those who want to sit and watch, tickets for paid seats are available. 3. The vigorous mikoshi march of "Shinko-sai"
In contrast to the fancy Yamaboko parade, the rough and rowdy "Shinko-sai Mikoshi Togyo" also known as "Abare Mikoshi" (meaning the "out-of-control mikoshi) is held from evening. 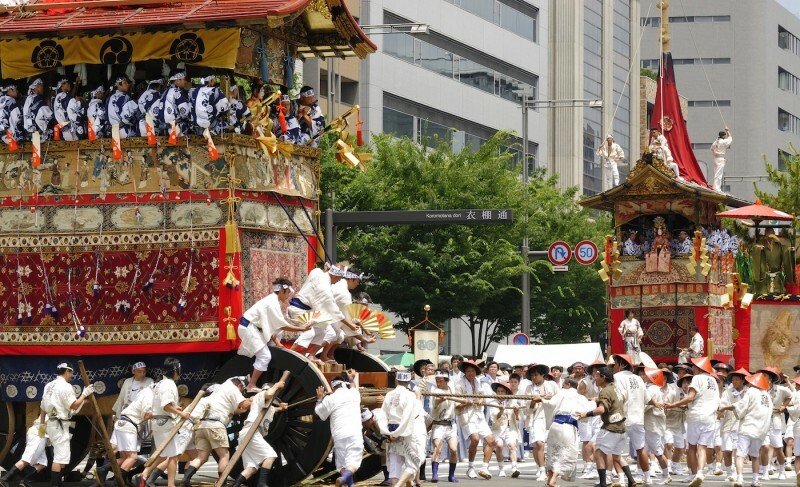 It is a powerful sight to see the men vigorously carry the wild mikoshi. They yell out "hoitto, hoitto" as they raise the mikoshi high in the air, and the crowd cheer, bringing the excitement level to a peak. Other useful Info. Tickets for paid seats are available. Due to Gion Matsuri and especially its Yoiyama and Yamaboko parade being held right after the end of the Japanese rainy season, you will experience severe heat. Please do not forget to bring drinking water with you, and wear hats in preventing dehydration. A. Please do not lose sight of children as well as elders you are with. B. For those on school trips, please be back at your hotel/lodging by 8 pm. C. Please be careful with your belongings. Furthermore, please do not drive your own vehicles to the festival. If someone you are with, or your belongings have gone missing, or if there is somebody wounded or sick, please quickly alert those in charge such as the areas' security guards.